Shadow Working in Project Management aims at contributing to our knowledge of all things unconscious and irrational in our behaviour. It takes the form of an empirical research, and therefore addresses mostly the tools and techniques available to get in touch with Shadow aspects of self and collective, to recognize how it manifests, how it can lead to conflict, and ways to address it. From that perspective, it advances on to question the underlying beliefs of current management practices. It explores as well the inherent need for control in projects, being those of a professional nature, or other ventures. It challenges the strength of the concept of the "rational man" and its protagonism. Joana Bértholo’s work explores the role and nature of theShadow in the context of projects and their management, with an emphasis on techniques to address it. Despite being directed to managers and dedicated to the analyses of the managerial discourse, the tools and processes it proposes have universal relevance, based on the fact that the Shadow is everywhere, within everyone, from the individual to the global scale. 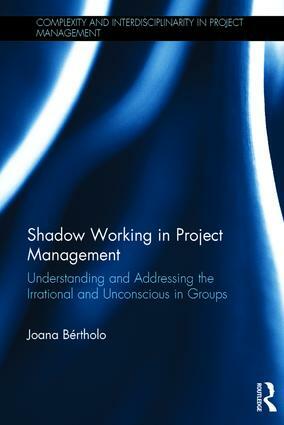 "Shadow Working in Project Management by Joana Bértholo is one of the most comprehensive works on Shadow outside that of Jung's work that I have seen. She brings you a 360° perspective of how Shadow emerges in project management. Through her research, she illustrates how individuals' Shadows are difficult enough to work with, however collective shadows that emerge within teams are even more complex. Joana reminds you of what isn't evident, the multiple facets of Shadow and ways to navigate through their complexity. It was an honour and privilege to be interviewed for the book and I will definitely recommend to my students, project managers, OD specialists and anyone who wants to take a deep dive with individuals and their teams." - Donna Karlin, author of Leaders: Their Stories, Their Words - Conversations with Human-Based Leaders™; Founder and Principal of the No Ceiling, Just Sky™ Institute. Chapter 6 – Account on a personal crisis: was Shadow-work worth the hard-work? Joana Bértholo is a researcher, novelist and playwright. She first attended the Fine-Arts and later a PhD in Cultural Studies. Art processes are her preferred mode of research, using writing as a platform to investigate on a wide scope of interests, such as technology, sustainability, and the darker aspects of groups and community. Modern project management needs more than tools for creating order and control. The traditional approach to project management works in stable and predictable environments. Yet, reality tells us that managing projects mostly means managing continual change of project constraints, social dynamics, uncertainty and increasing complexity. New fields need to be sourced to understand project management from a broader range of perspectives. The purpose of this Series is to explore new, interdisciplinary approaches and perspectives on complexity in project management, with a particular focus on projects, programmes and portfolio, the vehicles that are fundamental for everything from the delivery of new products or services, to the development of new business processes and the transformation of the organization itself. The titles in this Series narrate emerging approaches to project management research and practice from a variety of fields around arts, discourse theory and cultural studies. The aim is to extend our understanding, transfer and adoption of new research methodologies to encourage an interdisciplinary thinking and doing of project management in times of increasing complexity.